His checkerboard approach to music this time lands Kit Watkins on the square that's barely there; Ambient music. 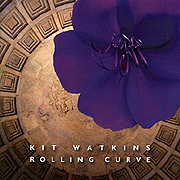 His release, Rolling Curve, is truly devoted to music based on the relationship between sound, time, perception and mood. At its least, the album is a well-conceived and executed ambient soundscape. At its best, Rolling Curve takes you out of the conventional world and into an area as difficult to distinguish as that between blue and green. Sounds evolve and fold, roll and sweep and have nothing to do with what is but everything to do with what is feels like. The music seeps into your room, through the keyhole and around the door jam, like smoke from a smoldering concept or mist from a descending idea. With the creation of this music, Watkins also realizes a borderless space. Through listening, we approach the stillness attained by the musician in his making of this music; we are present for that which is beyond the reach of words.